One of A.C.E. Building Service’s favorite projects of the year was an office renovation for our friends at Schaus Roofing and Mechanical Contractors. Established more than 90 years ago, Schaus is one of our longtime trusted trade partners. 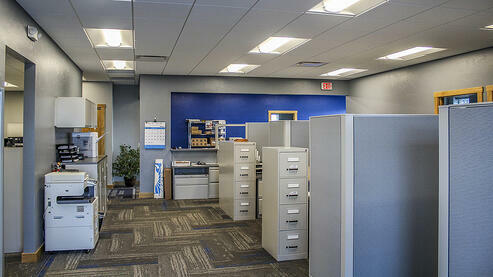 The firm, located at 2901 Calumet Avenue in Manitowoc, Wisconsin, hadn’t enjoyed any office updates since 1970. So it was time for some refurbishment—and a bit of creative fun, too. This project involved the renovation of existing offices with the goals of optimizing the space and creating a contemporary working environment for the company’s staff. In addition to optimizing the office space and making it more commodious, we worked to minimize disruption to existing operations during construction. The office remained open for the entire duration of the project meaning safety was of the utmost importance for A.C.E. crews and Schaus staff. The project was divided into two phases, which allowed the transfer of all employees into one portion of the office while work was being conducted in the other. Of critical importance, too, was maintaining a safe and clean environment for Schaus staff and visitors throughout the duration of the project. As a result, A.C.E. and its client had to make design decisions quickly and integrate our construction schedule with the delivery of the office furniture, as all staff needed to be transferred into the completed Phase I in order to begin work on Phase II. We suggested the use of walk-off carpet tile at building entrances and point of entry between the office and the shop area in lieu of standard flooring materials and carpet floor mats. This eliminated the risk of staff or clients tripping over the mats, which can become tripping hazards if caught in swinging doors or on shoes. We worked with Anne Myers, an interior designer with Kaeden Services, to develop the color scheme and materials selections for the office interiors. And the Creative Fun Begins! It’s often the creative things — the unique and meaningful — that can make a difference in an office. In this case, things came together beautifully. Schaus Roofing and Mechanical President Jerry Schaus happened to still have an old valve from an old school project that the company's founder worked on in the 1940s. 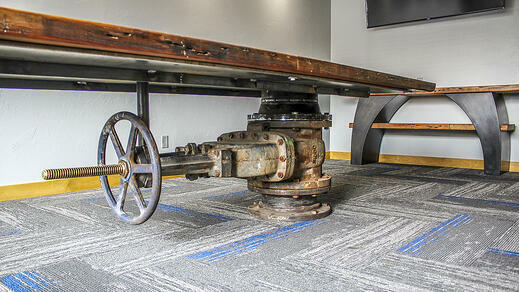 Schaus and our team worked directly with Brandan Gauthier, a local artisan and carpenter, to create a truly unique conference room table that incorporates the valve as the table base. Schaus also sourced reclaimed hardwood flooring material salvaged from a local industrial demolition project and incorporated the material as a feature wall in the president's office and conference room. A.C.E. Carpenter Ross Moore sorted through and hand selected each individual piece of wood and placed them on the wall to create the feature walls. Additionally, owner Jerry Schaus constructed his own office desk from raw angle steel and reclaimed wood to add a personal touch to the project. Eric Augustine served as Project Manager for this design-build project and was assisted by Project Superintendent Bill Shimek. A.C.E. handled design, while SMI Civil & Structural Engineers served as registered design professional for plans. Naturally, Schaus completed the HVAC work for the renovation. Today, the offices at Schaus Roofing and Mechanical are both modern and historical. It’s a mix that works exceedingly well — and leads to many great conversations when people come to visit. The A.C.E. team was honored to help our friends revitalize their office space, helping them continue their work for another 90 years.